A cataract is a clouding of the eye lens that makes it hard for you to see. 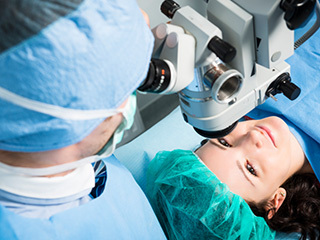 If your vision starts to cloud up you can have it removed with surgery and replaced with an artificial lens. There are new technology lenses that can help you become less dependent on glasses. You may begin to have problems with your eyelids affecting your vision and your daily activities. We offer a test at our office that along with an exam from Dr. Kosier will determine if your eyelid surgery may be covered by your medical insurance. If the documentation and the testing provides us with the information needed to move forward, we will call your medical insurance to get prior authorization if needed. We offer a laser surgery that is available at the office for patients that have increased pressure and that may want to become less dependent on eye drops. There are also surgical procedures which are done as outpatient surgery at the hospital including a new technology istent. Dr. Kosier may recommend these procedures for patients that are candidates.